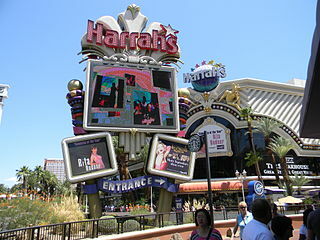 Harrah's Las Vegas is a hotel and casino located on the Las Vegas Strip in Paradise, Nevada. Ruth's Chris Steak House - Upscale Steakhouse - Steakhouse restaurant serving the best prime steak, that's sizzling hot. KGB: Kerry's Gourmet Burgers - Casual American - Chef Kerry Simon's restaurant serves Las Vegas' best burgers customized to your liking, along with signature snacks, sides and milkshakes. Flavors, The Buffet - Casual Buffet - Flavors is a Las Vegas buffet featuring live cooking stations, all-you-can-eat crab legs and gelato in one of the Las Vegas Strip's most diverse buffets. Oyster Bar - Casual Seafood - Belly up to the Oyster Bar at Harrah's and reel in oysters, fresh caught fish, clam chowder, scallops and more at this longtime Las Vegas seafood favorite. Ice Pan - Quick Bites Dessert - This Harrah's Las Vegas restaurant serves ice cream custom-made made from dairy and soy bases combined with your choice of flavorings and mix-ins. Starbucks - Quick Bites Cafe/Variety - Starbucks has two Las Vegas locations at Harrah's Las Vegas, near hotel registration and on the second floor between Toby Keith's and Ice Pan. Toby Keith's I Love This Bar & Grill - Casual American - Live country music and down-home Southern favorites make Toby Keith's Las Vegas restaurant at Harrah's your kind of place. 2,500 deluxe guest rooms with in-room amenities such as bedside remote control for TV and room lights, pay-per-view movies, dataports, custom furnishings, double sound-proofed walls, blackout draperies, 24-hour room service, hairdryers, irons and ironing boards, video checkout, non-smoking floors, and much more!